It was 11:10 and I was supposed to be on the road to Cincinnati. 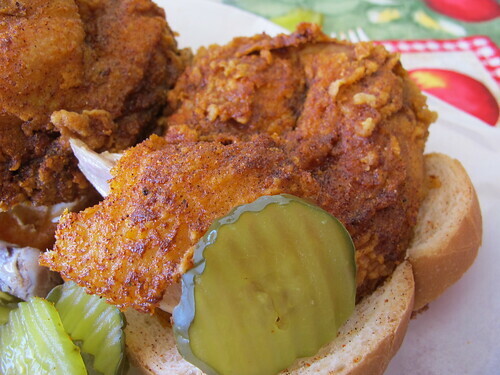 At least I had planned an early start for the relatively short drive to Southern Ohio, but the night before, when dinner conversation turned to inherently Nashville foods, hot chicken came up. 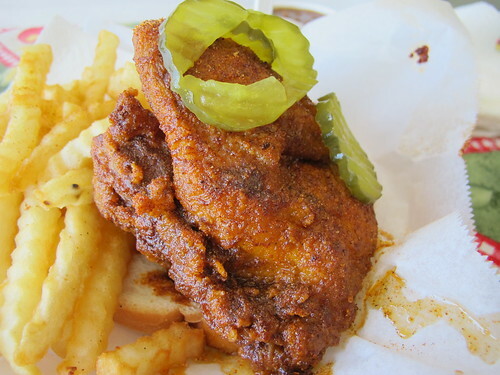 I’ve heard about hot chicken before mostly because of the Southern Foodways Alliance, specifically John T. Edge. 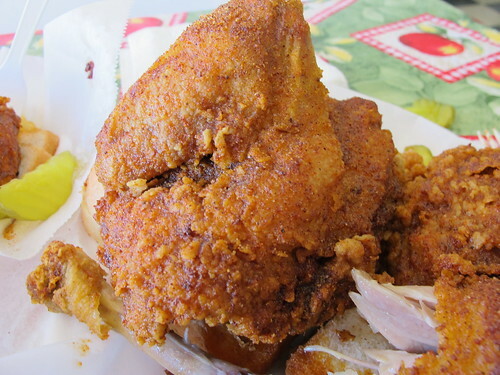 Prince’s Hot Fried Chicken made it to his list of 100 Southern Foods not to mention his book and now iphone app, Southern Belly. Prince’s also garnered a mention on Serious Eats. Hell, the extra hot chicken was even in an episode of Insomniac with Dave Attell. With all that press, I figured that arriving in Cincinnati a little late was worth it. Having read that Prince’s opened at noon, I was hoping to beat the lunch rush and be there by 11. While there was plenty of parking, there was already a line albeit a short one. Conveniently I didn’t have to wait an hour as the door to Prince’s opened a little early that day. Once inside it was another short line to order, but that gave me plenty of time to contemplate what I wanted and take in my surroundings. I had read that the Tennessee House of Representatives had made that declaration but I thought it was a joke. 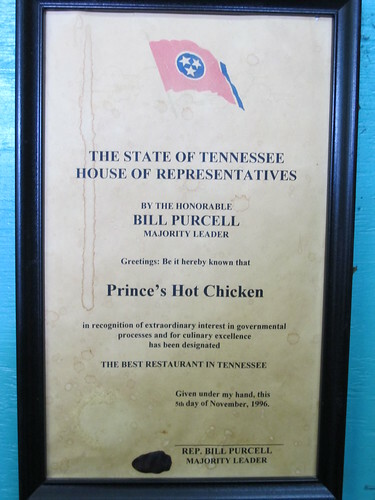 Best restaurant in the state is a lofty title; I can only hope that Prince’s Hot Chicken still has the chops to defend that it some 14 years later. Knowing just how often I make it to Nashville, I decided to err on the side of caution and order a little too much. Here a little too much meant a half bird medium, a breast quarter hot, a side of baked beans, a side of fries, and two waters. With all that warnings the hot gets, I was hoping that two waters would be enough. Amazingly, all my food arrived at the table before noon. The wait was nowhere near the 45 minutes that everyone had written about, although I suppose it can get a little backed up at 2 am. I thought it would be best to work my way up to the hot, so I started with the medium first. The chicken at Prince’s really is a beautiful color. I had originally thought this was just going to be chicken doused in hot sauce, but it’s so much more than that. Going for my favorite piece, the thigh, I was surprised to find the first thing I tasted was salt. That first bite of crispy skin was salty on the front but it delved into a cayenne laden tailspin. The dark meat was juicy, delicious and completely covered with that dusting of hot spice mix. Actually the medium was a manageable heat. It was a lot of salt and cayenne but quite good. Little did I know the real treat was underneath that thigh. 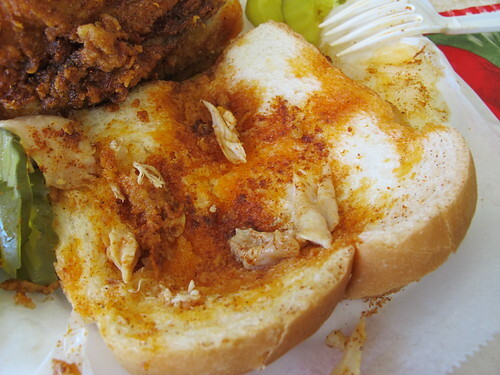 Every piece of chicken at Prince’s is served on top of white bread. This is one of the few times that white bread is worth its weight in gold. 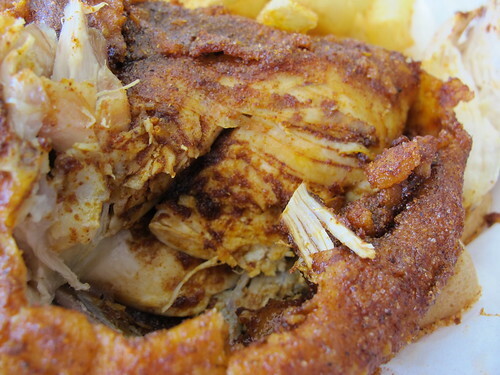 That simple piece of bread is cradling the chicken soaking up all the spices and chicken juice. Eating that piece of white bread was an ethereal moment. It was a symphony of schmaltz and spice that finished with a punch in the mouth. Emboldened, I decided to switch to the hot breast quarter. Starting with the wing, I surprised at how easily it pulled away from the breast. Equally surprising was the immediate oddly mild flavor of the hot. Little did I know that the hot chicken was just stoking the fire that the medium had built. One thing that caught me off guard was just how deep the spice ran in the chicken. Tearing away a piece from the breast, it looks like that deep red trail of spice has penetrated all the way to the bone. Unfortunately I noticed a few downsides as well. With the white meat, the skin seemed to be a little gummy, not that spicy crispness that I had experienced with the dark meat. Another negative aspect of the white meat on both the medium and hot is that they were both overcooked and dry. While I was making these startling realizations, there was a silent war of attrition going on. 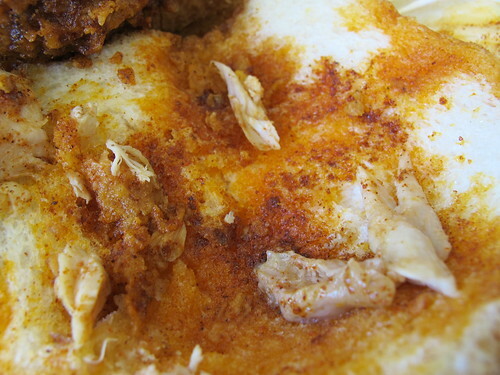 The hot in the hot chicken was making itself known. It wasn’t an immediate heat but all this time it had been building and building. Slowly but surely the warning signs began appearing. I was drinking more water, my nose was running, I was beginning to sweat, I might have even started to tear up a little. Yes the hot at Prince’s lived up to its name. I had spent all the time focusing on the chicken; I had almost forgotten my sides. Frankly the baked beans would probably have been better forgotten. 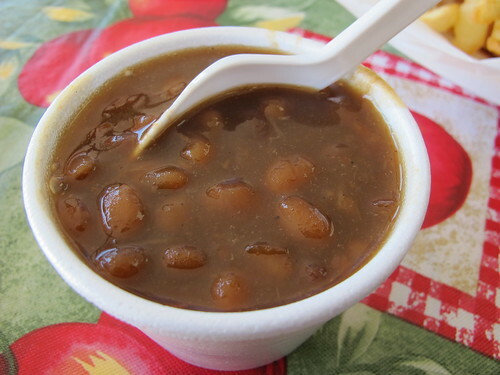 Syrupy sweet and with a pitiful few flecks of pork, these beans were too sweet and really out of place amongst the plates of spicy chicken. French fries seemed like a more natural side for fried chicken. 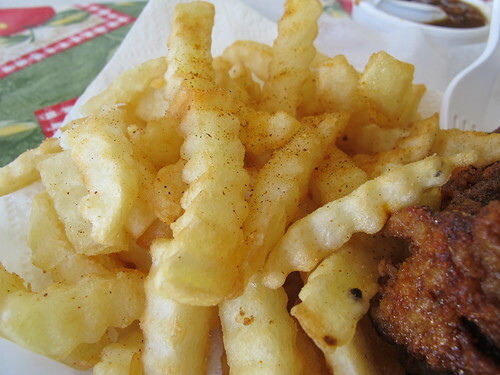 Your standard crinkle cut fries, they were hot and crispy, but that little bit of seasoning just didn’t cut it. These were decent fries, but really a waste of space when compared to the chicken. Despite ordering an excess of chicken, I can’t help but think I didn’t give the medium and hot a fair comparison. After gushing over the medium dark meat and then finding the hot white meat to have gummy skin and dry meat, I went back to the medium and tried the breast. The medium white meat was overcooked too, but strangely the skin was still perfectly crispy. Does the hot seasoning make the skin gummy or was that an anomaly? Even with these questions, I have to say I enjoyed the medium much more. With the medium, you get to enjoy both the chicken and the full range of seasonings, whereas with the hot it’s all spice and nothing else. That being said, I’m leery of ever trying the extra hot, especially after seeing what happened to Dave Attell. 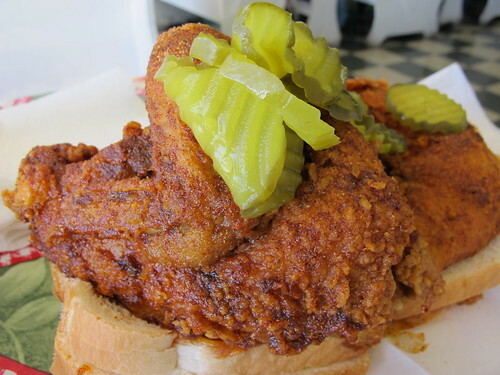 In the meantime, my next task is to visit Bolton’s Spicy Chicken and Fish and see which is the better hot chicken in Nashville? 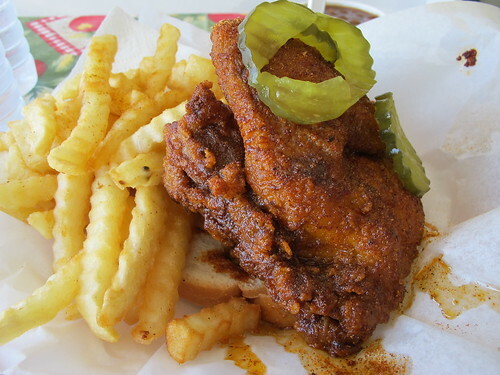 Regardless, I’ll have to say that Prince’s Hot Chicken Shack is a must visit.